Sunburn is an inflammation of the skin caused by overexposure to ultraviolet radiation from the sun. Sunburn is caused by exposure to the ultraviolet (UV) rays of the sun. There are two types of ultraviolet rays, UVA and UVB. UVB radiation causes most sunburn (about 85%). However, most UVB rays are absorbed by sunscreens , but only about half the UVA rays are absorbed. Although sunburn itself is not a serious health problem in the short term, skin cancer from sun overexposure is in the early 2000s a growing problem in the United States. Both UVA and UVB radiation play a role in the development of a form of skin cancer called malignant melanoma. According to the American Cancer Society, melanoma accounts for only 4 percent of all skin cancer, but 79 percent of skin cancer deaths, or about 7,900 deaths annually in the United States. In addition, more than 1 million Americans develop nonmelanoma skin cancer each year, although deaths from this form of cancer are much more rare (about 1,000 per year). Skin contains a protective pigment called melanin. The darker the skin tone, the more melanin is present. Fair-skinned people are most susceptible to sunburn, because their skin produces only small amounts of the melanin. However, even the darkest-skinned people can get sunburn and skin cancer. Infants are most susceptible to sunburn and should be kept out of the sun at all times. Children are more susceptible than adults, and because of their outdoor activities get three times more sun exposure on average than adults. It is estimated that one-half to three-quarters of an individual's total number of lifetime sunburns occur in childhood and adolescence . Long-term effects of repeated sun overexposure and burning can cause premature aging and wrinkling of the skin. Overexposure can increase the risk of skin cancer, especially a serious burn in childhood. Individuals at highest risk for developing melanoma are those who have intermittent severe (blistering) sunburns in youth or adolescence. Occasionally an allergic response to a drug will cause a skin reaction resembling sunburn in the absence of sun exposure. Infants and children are more likely to get sunburned than adults. Individuals who live in areas where the climate is mostly sunny year round (Arizona, southern California) are at higher risk both for sunburn and skin cancer. Those living at high altitudes are also at higher risk. The chance of being sunburned increases about 4 percent or every 1,000 feet (300 meters) rise in altitude. Fair-skinned, pale, freckled individuals are more likely to get sunburned than individuals with darker skin. Sunburn is extremely common. One poll found that in the summer of 1997, 13 percent of children had developed a sunburn in the preceding week. The ultraviolet rays in sunlight destroy cells in the outer layer of the skin, damaging tiny blood vessels underneath. When the skin is burned, the blood vessels dilate and leak fluid. Cells stop making certain proteins because their DNA is damaged by the ultraviolet rays. Repeated DNA damage can lead to cancer. Stevens-Johnson syndrome —A severe inflammatory skin eruption that occurs as a result of an allergic reaction or respiratory infection. Toxoplasmosis —A parasitic infection caused by the intracellular protozoan Toxoplasmosis gondii . Humans are most commonly infected by swallowing the oocyte form of the parasite in soil (or kitty litter) contaminated by feces from an infected cat; or by swallowing the cyst form of the parasite in raw or undercooked meat. When UV rays burn the skin, immune system defenses that identify the burned skin as foreign are triggered. At the same time, the UV rays transform a substance on the skin that interferes with this immune response. While this keeps the immune system from attacking a person's own skin, it also means that any malignant (cancerous) cells in the skin will be able to grow freely. Sunburn causes skin to turn red and blister. Symptoms appear from one to 24 hours after sun exposure and peak several days later, after which dead skin cells peel off. In severe cases, the burn may occur with sunstroke ( vomiting , fever , and collapse). Severe cases of sunburn may require hospitalization . The doctor should be called any time there are symptoms of heatstroke, dehydration , blurred vision (possible sun damage to the eyes), chills, fever, vomiting, or blistering associated with sun exposure. Sunburn is easily diagnosed by visual inspection of the skin. No laboratory tests are needed. People who are severely sunburned should see a doctor who may prescribe corticosteroid cream to speed healing. Extreme sunburns that blister may require treatment in a hospital burn unit and intravenous fluids to prevent dehydration. 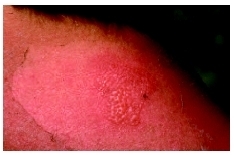 Individuals who develop sunburn as the result of a drug reaction should see a doctor promptly. Patient with a second-degree sunburn on the back of the neck. is one of the most frequently recommended to reduce inflammation. Short-term prognosis is excellent. Moderately burned skin should heal within a week. While the skin will heal after sunburn, the risk of skin cancer increases with exposure and subsequent burns . Even one bad burn in childhood carries an increased risk of skin cancer. Infants under the age of six months should be kept strictly out of the sun. Sunscreens have not been approved for use by infants. Everyone age six months and older should use a water-resistant sunscreen having a sun protective factor (SPF) of at least 15, with an SPF of 30 or more strongly recommended for children. Sunscreen should be applied 15–30 minutes before going outside, as it takes that long to bond effectively with the skin and become effective. Sunscreen should be reapplied every two hours (more often after swimming). Limit sun exposure to 15 minutes the first day, even if the weather is hazy, slowly increasing exposure daily. Avoid the sun between 10 A.M. and 3 P.M. when the sun is strongest and most direct. Wear a hat or cap to protect the face. Use sunscreen when participating in snow activities such as skiing where sunlight is reflected off the snow. Wear an opaque shirt on water, because reflected rays are intensified. Parents, concern about their child's sun exposure is usually influenced by their own experience with tanning and sunburn. Until the early 2000s, a tan was considered healthy rather than an increased cancer risk. Many adolescents still desire a tanned look but should be discouraged from as much sun exposure as possible. Those who insist on tanning should be encouraged to tan gradually and avoid burns. Malignant melanoma —The most serious of the three types of skin cancer, malignant melanoma arises from the melanocytes, the skin cells that produce the pigment melanin. Sunscreen —A product that blocks the damaging rays of the sun. Good sunscreens contain either para-aminobenzoic acid (PABA) or benzophenone, or both. Sunscreen protection factors range from two to 45. Sunstroke —Heatstroke caused by direct exposure to the sun in which body temperature increases to dangerously high levels. See also Heat disorders . Auerbach, Paul S. "Acute Effects of Ultraviolet Radiation on Skin: Sunburn and Tanning." Wilderness Medicine ,4th ed. St Louis, MO: Mosby, 2001. Hill, David, et al. Prevention of Skin Cancer. London: Kluwer Law International, 2003. McNally, Robert Aquinas. Skin Health Information for Teens: Health Tips about Dermatological Concerns and Skin Cancer Risks. Detroit, MI: Omnigraphics, 2003. American Cancer Society. 1599 Clifton Road, Atlanta, GA 30329. Web site: http://www.cancer.org. Guenther, Lyn, and Benjamin Barankin. "Sunburn." eMedicine Medical Library , October 27, 2004. Available online at http://www.emedicine.com/ped/topic2561.htm (accessed December 1, 2004). Takayesu, James K., and Randy P. Prescilla. "Sunburn." eMedicine Medical Library , April 28, 2003. Available online at http://www.emedicine.com/wild/topic71.htm (accessed December 1, 2004). Heres an article explaining the damage of sunburn and the effects on your children's skin.